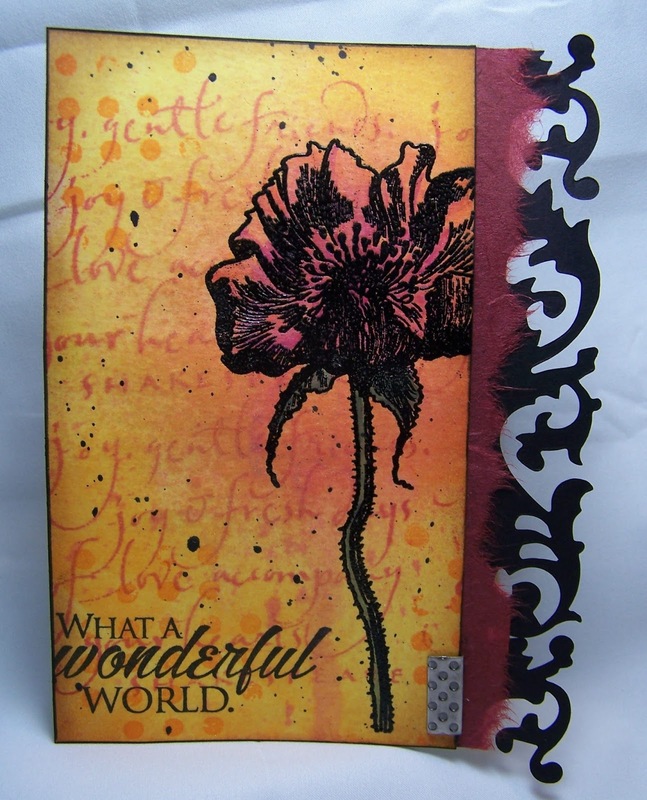 Just thought I would post a card I made using Catherine Pooler inks (with brayer) to build a vibrant background. I also used the same inks to stamp the script and distressed dots to further build in the layers. The poppy image was embossed, sprayed with Glimmer Mist, and then colored in with Derwent Inktense Ink pencils. I then adhered this panel to a card that was short cut on the right edge so that I could add the Scrollwork die cut along with some pretty mulberry paper. A sentiment and a bit of metal embellishment was then added to finish up the card. I was a little bummed that I trimmed the left edge of the panel a bit to close to the sentiment but, it is what it is. Guess it goes with being hand made, right?! Moroccan Spice, Club Scrap, Inc.
Superfine Black Embossing Powder, Gary M Burlin & Co.